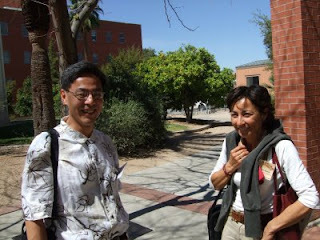 This is Koji Mukai and Domitilla de Martino. Koji is one of the leading experts on intermediate polars in the whole world. Domitilla is also involved in IP research and presented a paper on results from the space X-ray observatory XMM Newton. For those of you who thought astronomers were geeks with no looks or personality, these two will shatter your ill-conceived notions in a matter of seconds. 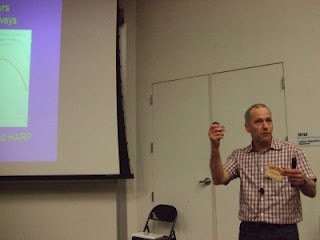 Axel Schwope is another brilliant and entertaining astronomer using XMM Newton and other telescopes to examine some of the brightest polars in x-ray, optical spectroscopy and optical cyclotron spectroscopy. I wonder what he tells people at parties when they ask him what he does? You think astronomers don't have a sense of humor? You might be wrong. David Buckley shared this political cartoon from South Africa starring the SALT telescope. He was also brave enough to share this photo of himself in 'trying to get to first light' mode. He really looks like Saddaam Hussein out of the foxhole. Below, a rare sighting of Boris Gaensicke (left with pony-tail) actually sitting still! He was chair of the session on this day. Here he is seen enjoying the talk from David Buckley (right), who looks much better with a shave and a bath. 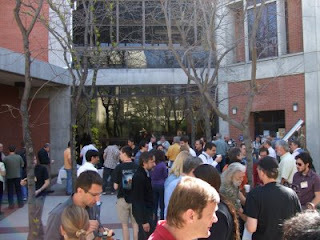 Nerd Herd- here is a typical coffee break at the conference. The weather has been absolutely fabulous. 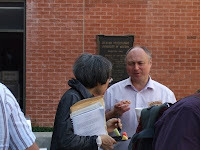 Everyone enjoyed the outdoor courtyard gatherings in between papers. Christpher Tout sharing ideas and sunshine during the break. Later, I pulled him aside to do an interview for a podcast. He was great. 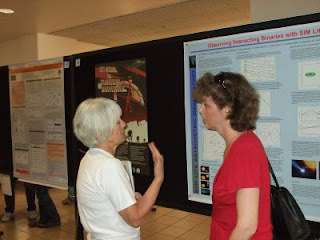 Paula Szkody and friend discussing the merits of the poster in front of them. Paula also graced us with an interview for the podcast. We talked about SDSS results and what is in her future. In a word- LSST. For those of you who are acronym challenged, that is the Large Synoptic Survey Telescope. More polar humor. EF Eri is known mostly for the fact that it doesn't do anything most of the time. It's not accreting and we can examine the secondary star because there is no accretion light contribution in the way. A little Star Trek humor lightens the mood.